Prenatal vitamins are nutritional supplements taken during pregnancy to ensure that a growing baby receives all the nutrients required for healthy development. A well-balanced diet that includes grains, fruits, vegetables, protein sources and dairy products will probably supply most or all the vitamins and minerals needed for a healthy pregnancy but the American Congress of Obstetricians and Gynecologists (ACOG) recommends taking a prenatal vitamin supplement to ensure you receive enough of the essential nutrients. During the first prenatal visit your doctor may recommend either an over-the-counter or prescription prenatal vitamin. Important nutrients to be taking during pregnancy include folic acid, iron, calcium, vitamin D, DHA and iodine. Folic acid has been recommended for pregnant women since the 1990s and the ACOG recommends that pregnant women take 400 micrograms of folic acid every day. The recommendation followed a 1991 study which concluded that folic acid helps prevent birth defects in the brain and spinal cord. Subsequent studies found that taking this man-made form of the B vitamin folate protects babies against congenital heart disease and cleft lip and palate. Dietary sources of this vitamin are leafy green vegetables, beef liver and beans as well as fortified cereals and grains. Although cereals and grains have been fortified since 1998, prenatal vitamins with folic acid are still recommended for pregnant women. Women planning a family are also advised to take 400 mcg of folic acid every day for at least a month before becoming pregnant. You might not have an iron deficiency before you become pregnant but the demands of pregnancy can lead to one. A pregnant woman needs more of this mineral so that her her body can increase blood volume and efficiently deliver oxygen to her baby. Very few women consume enough iron to meet this increased pregnancy demand. Without enough iron, a woman might be prone to infections, easily fatigued, and be more likely to have a premature and/or low birth weight baby. Dietary sources of iron are lean meat, poultry and seafood, iron-fortified grains, leafy green vegetables, beans, nuts and dried fruit. You can increase iron absorption by eating foods rich in vitamin C, such as grapefruit, mango, tomatoes, spinach and broccoli. During pregnancy it’s recommended that women take 27 mg of iron every day. This mineral helps your baby build strong bones, teeth, muscles and nerves, and its also instrumental in the development of muscles and nerves. You can probably get the 1,000 milligrams a day of calcium you and your baby need from dietary sources such as milk, kale, broccoli and fortified orange juice, but if for some reason you can’t eat enough of those foods, a dietary supplement is advisable. Getting enough calcium during pregnancy is good for you too, as it can reduce your risk of hypertension and preeclampsia, a potentially dangerous pregnancy condition characterized by high blood pressure. Calcium may, however, interfere with iron absorption. Vitamin D can help your body absorb calcium and boost your immune system. Because of the vitamin’s ability to improve calcium absorption, it can play an important role in helping your baby’s teeth and bones grow. You can get vitamin D from sunlight, from foods such as fatty fish, milk and vitamin D-enriched cereal, but if it sounds easy enough to get vitamin D from natural sources, the statistics prove otherwise. One third of the U.S. population is at risk for vitamin D deficiency. During pregnancy you want to take 200 milligrams of DHA or docosahexaenoic acid every day to help your baby’s eyes and brain develop. Not all prenatal vitamins contain DHA, so ask your doctor about taking a DHA supplement. Foods that contain this omega-3 fatty acid include fish as such as salmon and trout, but also DHA-fortified orange juice, milk and eggs. If you don’t eat fish, it can be hard to get the recommended amount of this healthy fatty acid. Some research suggests that DHA supplementation can help reduce the incidence of preterm delivery and low birth weight babies. Your body uses the mineral iodine to make thyroid hormones, which help regulate heart and digestive function, muscle control, brain development, mood and bone maintenance. During pregnancy a woman needs 220 micrograms of iodine a day to help her baby’s brain and nervous system develop. You may normally get enough iodine from dietary sources, such as fish, dairy products, enriched cereal and bread and iodized salt, but iodine requirements increase substantially during pregnancy. Prenatal vitamins do not necessarily always contain iodine. 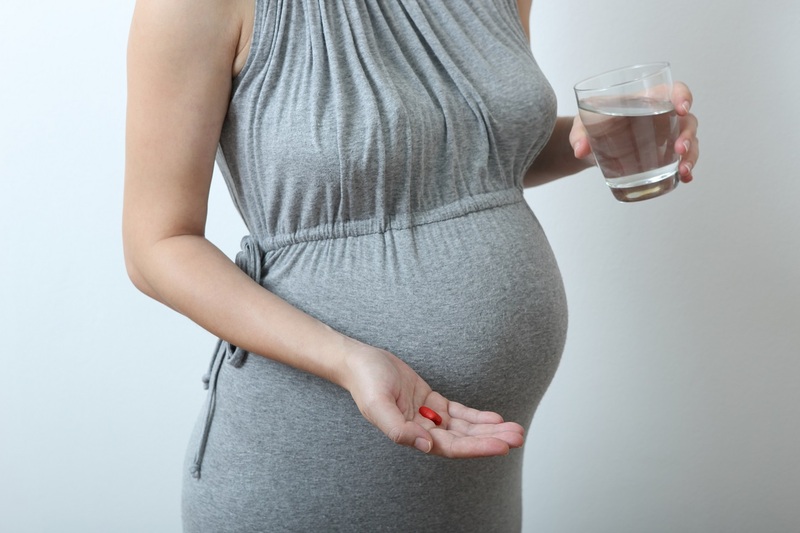 If your prenatal vitamins don’t include iodine, ask your doctor whether you need a supplement. While most over-the-counter prenatal vitamins work for most pregnant women, there are cases where supplementation causes problems. For example, many women experience constipation when taking an iron supplement and may need to adjust her diet. Or a woman may experience nausea or indigestion taking any supplement during the first trimester. If you experience any problems while taking prenatal vitamins, be sure to discuss your concerns with your doctor, as there may be solutions. Can Prescription Drugs Considered To Be Safe Affect My Pregnancy?